Both Samia (12) and Fatima (9) were diagnosed before coming to Ireland with sensorineural hearing loss and use cochlear implants to hear. Mr Basharat says the treatment his daughters require will not be accessible in Pakistan. He also warns that they will struggle to communicate as they do not speak Urdu. The family arrived in Ireland four years ago after Mr Basharat’s brother, a UK citizen, moved to Oldcastle in Co Meath and bought a takeaway. Mr Basharat had been living in the UK where he was awaiting a decision on his appeal for a work permit after his initial application was rejected. 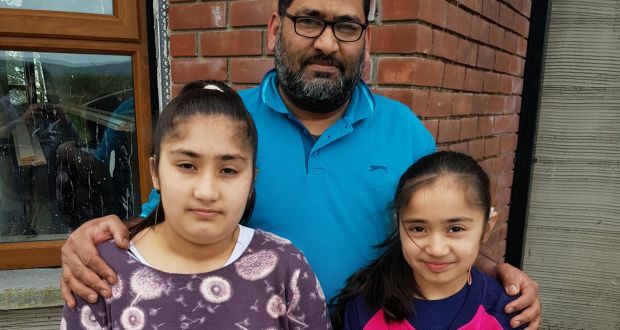 His wife and children followed him in 2011 after it became clear that his daughters needed specialist care and were fitted with cochlear implants in the UK. In 2015 the family moved to Ireland as dependents of Mr Basharat’s brother under their treaty rights as family members of an EU national and were given a temporary stamp to remain.